As with a few other fellow bloggers, we were lucky to receive one of my favorite “blog freebies” to try recently – truffle products by La Boutique de la Truffe. Cha-ching! As some know, for most of us, blogging will barely help us buy a cup of coffee at a year’s end – that is if you have an ad up. When we get offered to test out powdered sauces (gag) we usually pass, but when truffles were offered I jumped up and down like a little schoolgirl. I know truffles seem to be that annoying foodie buzz word that gets all us food-lovers screaming like Beatles fans in the 60’s, but I still say they are worth the hype. It is obvious we like them – a lot. You’ll find truffle recipes all over We Are Never Full: like here and here and here. And if you indulge and buy something from La Boutique, it is an investment and one that will pay off in big flavor that really can not be duplicated any other way. La Boutique de Truffe started in 2003 by a French immigrant, Cèline Labaune, who had a “passion for truffles” (straight from the media kit). Why am I telling you this? Because if I am going to spend $35 for a 3-ounce pot of truffles, it helps to buy them from 1) someone who is passionate about them and 2) someone who is French and knows her stuff. It used to be very difficult to get good quality truffle products here in the US and I can say, without hesitation, that the truffle products we received from La Boutique were very good. Yes, it is still expensive but a little does go a long way. 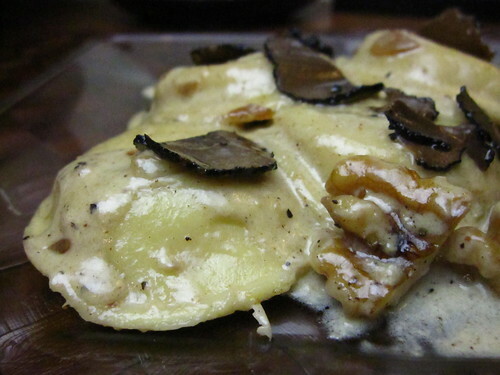 For this quick dish (bite me Rachel Ray – this is a real 30 minute meal), we paired the nice truffles with an easy cream sauce with walnuts and bought fresh ravioli from our local Italian shop. If you don’t have a local Italian shop, it’s ok, you can use your favorite store-bought variety or even make your own. 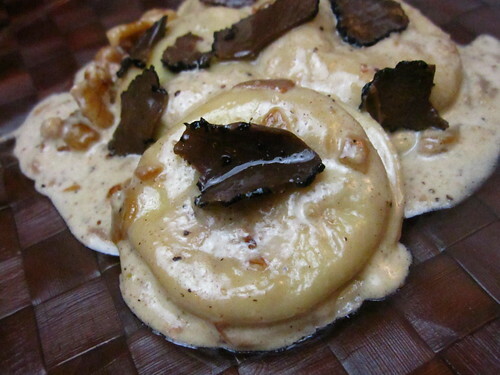 To top the ravioli, we only used a small amount of the Truffle Carpaccio we were lucky to try out. While we were in Italy a while ago, we purchased a few white and black truffle products at an amazing store (where we dropped quite a few euro at, but it was worth it) – Tartufi Morra in Alba. For much more than La Boutique charges, we purchased an excellent tube of white truffle paste which lasted us more than a year – and which we sadly finished up with this dish. I recommend buying this one from the La Boutique website – it is super strong and really, really lasts. You could wow a few guests with this super simple dish – they’ll feel special because they’ll think you spent a lot of money on them but, in reality, per person it’s not a real bank-breaker. But they don’t have to know… right? Boil abundantly salted water for the ravioli. Lightly saute the sliced garlic till golden in butter (about 30 seconds). Add all the walnuts – both the smashed/blitzed ones and the whole ones. Allow the walnuts to warm and absorb a bit of the butter (another 30-45 seconds). Add the cream and then the truffle paste along with a pinch of salt and pepper and stir. Reduce the cream a little so it thickens and add your cooked ravioli to the sauce. Kill the heat, toss ravioli so they are covered in sauce and plate. Top each dish with some truffle carpaccio and sprinkle with grana padano or parmigiano. Make sure you get some of those whole walnuts on each plate! Never bought truffles. I’ll have too. So many great recipes to make like this one. A truffle heaven! I can never have too many truffles 🙂 Love the walnut truffle cream sauce! I shouldn’t be looking at this with an hour to go till lunchtime. I’ve never bought truffles. One day I will definitely try. Oddly enough yesterday I was talking about great pasta dishes I’ve made in recent times and was thinking about your pasta with the walnut cream sauce. I come on to your site today and see another pasta with walnuts that looks equally rich and beautiful. Thanks, Rachel! We appreciate that! We loved that pasta dish too – nuts are underrated as a protein in a dish! Thanks Rachel. I love that you remember that old dish – that’s a back in the day joint! I still thank you for giving it a try! Who would get tired of truffle recipes????? It looks incredible, you guys! LOL… you crack me up. You need to also wink and pout your lips as you say hi to celine. she totally goes for that. Your dish looks absolutely decadent and if anyone ever sends me truffles, I’ll know where to look for a recipe. Bloody hell, I wish someone would send me truffles. Love the tip for truffle paste. How does it–and the carpaccio–compare to fresh truffles? And would you guys rather get French jarred truffles or paste rather than fresh domestic truffles? Hey Robin! Thanks for stopping by. The carpaccio isn’t even close to what a fresh truffle tastes like – when it’s fresh it has so much nose and the flavor is much more intense. BUT, with that said, the carpaccio is very tasty and is pungent enough w/ a great flavor. Nothing beats the fresh ones – but I’m not rich so I’ll save those for the extravagant once-in-a-lifetime restaurant meals. HMMM… good question about French jarred vs. fresh domestic. I am really not sure about that. I think I’d need to do a side-by-side comparison to answer that correctly. I think my rule of thumb for truffles would be fresh first, jarred second. Except I may go for jarred white truffles over fresh black. Awesome questions – love that you’ve made me think! And I think that they would pair tremendously with duck. Can’t wait to come over and try it 😉 – I’m serious. Tell jimmy we said hi! Lovely recipe. I know what I want Santa to bring me. I will be very , very good in hopes of finding a tube of truffle paste in my stocking. Mmmmm nice call with the truffles. I got the same stuff and turned used it along with some comped Scharffen Berger to make chocolate tagliatelle with black truffles and cacao nibs. I’m trying to train my lab to find truffles… the problem is there are none in New England, so I’m settling for other types of buried treasure… it’s not going very well. Your ravioli look awesome! Chicago is all covered in snow today and a plate of this would definitely make it all better. What’s not to like about pasta, heavy cream, nuts, and truffles. Wish I was smart enough to figure out how to grow truffles in a greenhouse. Dream on. I have to admit I don’t think I’ve ever tasted *real* truffles… and I spent a year in Southwest France! Of course I was a poor student teacher back then and could barely afford to go out to eat let alone order something with truffles. great question, noelle. i think the white truffle paste is worth it. it’s very strong and tastes/smells like a truffle should. a little goes a long way. it lasts too and can be used in many, many ways. i think someone has to really taste test truffle oils. some just don’t cut it. I really feel that anything you buy from this company, you’ll get the best that’s out there. to me, yes, it’s worth it. but i absolutely adore the taste and smell of truffle. if you haven’t had any, I would try and find a restaurant in your town or on your next vacation that has a dish incorporating truffles so you can decide if it’s worth the investment to you. i see from your bio that you lived in toulouse! we ate ridiculously well while we were there… love that town. i’d love to see what you think about truffles! let me know if you decide to take the plunge! I love all types of mushrooms so I can only imagine I would love truffles even more. I have been leery about purchasing after reading about the synthetic ingredients that flavor some “truffle” products. I did ask for a gift card to Zingerman’s this year, so if I’m lucky I’ll soon be stocking up on truffle products AND bottarga, which has also been on my must-try list for a while now! I’ve had a few fresh Washington State ones–some were very good, some meh. Haven’t tried the jarred yet..
Oh, and Jimmy says Hi!!!! A luxurious, decadent dish that’s wafts of pungent truffle and all it’s glory. I’m slayed. the ravioli looks scrummy. i adore walnuts in my food. i love this product. when one cant find whole truffles this is the sort of product one looks for. but hnstly, “truffle oil” (w no truffles inside the bottle) needs to be banned from the world. Wow!! 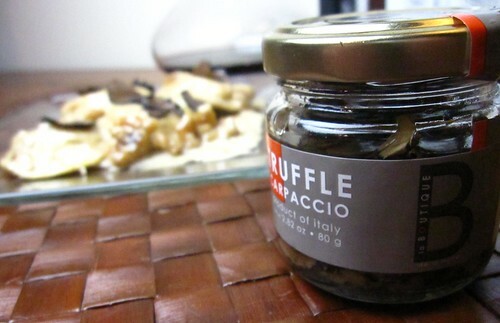 That is so awesome that you received truffle products. Like many people, truffles are one of my most favorite things ever. This ravioli sounds amazing. i’ve been visiting your blog for a while now but never posted! I finally tried this recipe and although I did not have the special truffles (which I’ve ordered), this was lovely. Next time I might actually leave out all or most of the walnuts because we love the pure truffle flavor, but thank you for introducing us to this product and sauce! I feel hungry when i see this. Its good to taste. I can never say no this. I’d love to make this recipe but I’m afraid of trying. I’m not good at making raviolis.